At first the idea that someone would read my blog was beyond my scope of thinking. Then I asked and found out that a stranger would willingly post their content on my blog for others to read and that was even more of an amazing thought. Well it happened. Chris Ferrell was coming to this blog on regular basis. He was reading my posts and leaving comments on it because he wanted to. Then he had agreed not only once but twice to guest post for me. What a humbling experience! Chris, thank you very much for being willing to share your gray matter with the readers of Morning Erection and help me out with my desire expand the scope of my blog. 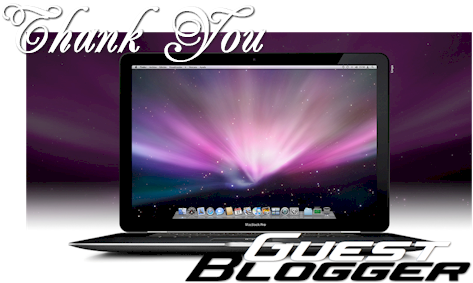 You were the first guest blogger and words cannot express how much I appreciated your willingness to help me. Thanks again for sharing this time around. I truly hope the experience both times has been as beneficial for you and Nerds of the Round Table as it has been for Morning Erection and its readers. I have November 2011 through February 2012 filled with guest bloggers and I am still looking for future months. If anyone is interested please check out my Guests page. Chris Ferrell is guest blogging for me once again. Chris was my first guest blogger way back in January 2, 2010. Chris and I share a love for movies. His site is about movies, comic books, video games and much more. His first guest post was about the now canceled SciFi channel show, Battlestar Galactica. It remains one of the most popular guest posts to date. If you haven’t yet had the pleasure of visiting Nerds Of The Round Table, please do so after you read his post. As always, it is a great honor for me to be able to have a guest blogger, especially one who is willing to do it more than once. Readers, as a favor to me please show Chris the courtesy of leaving a comment. Thank you very much. I’m happy to be back providing a guest post for Tom once again. The first time I guest posted for Tom was probably close to two years ago and its been a lot of fun seeing how much Tom’s site has grown up in that time. I like to think its all because I was the first guest blogger… haha. All joking aside I’d like to thank Tom for the opportunity to come back again. I’ve become known for my posts about a variety of nerdy topics such as comics, video games, movies and things like that, but don’t worry today I’m here to flex my writing muscles a little bit and write about a topic I don’t blog about but am very interested in. If you’ve been watching ESPN lately I’m sure that you’ve seen all the talk of conference realignment. The landscape of college sports is rapidly changing and it may become unrecognizable a few years from now. But what has started this seismic shift and how will everything end up? Football and basketball schools have generally been separated into conferences. For instance there have been conferences like the Big 10, Big XII, and the Big East. Conferences were geographic groupings of schools. For instance the Big East was generally schools on the East Coast of the US. Grouping schools by geographic location would help to keep travel costs lower and provide for regional rivalries. It is this conference system that is now breaking down now. The beginning of the breakdown of the conference system can probably be traced back to 2004-2005. It was during this time the ACC began their initial raid of the Big East conference. In 2004 then powerhouse schools Virginia Tech and Miami departed the Big East for the ACC. Then in 2005 Boston College also departed for the ACC. This left the the Big East to scramble and try to find more school to fill the gaping void that was left behind. Louisville, South Florida, and Cincinnati came over from Conference USA and UCONN moved their football program up to Division I-A. This was able to save the Big East conference… at least until 2011. Since that point conferences realignment has been a major off-season topic each year and has steadily gained more steam. Recently the Big XII was lost teams to the Big 10 and the Pac 12 (12 teams for now). It has become popular to add more teams to the conference ranks, and the thought is that a 16 team super conference would be ideal. But why are schools trying to band together to make such large conferences? Pardon the simple answer, but in essence its all about the money. The conferences share income from things like Bowl Games and the NCAA tournament. For instance, if a team from the Big East wins the Orange Bowl there would be say $12 million that goes to the winning school. A portion of that goes to the conference and is split between the member schools. There’s a lot of money to be had and split among schools. The more bowl games your conference goes to, the more money you make. But, perhaps the biggest money driver is the huge television contracts that are being awarded to athletic conferences. ESPN recently bid on and won the rights to the ACC television rights. How much did they pay to have 12 years exclusivity to ACC athletic events? Estimates say the cost was about $155 million a year and over the 12 year contract that adds up to about $1.86 billion! That’s a lot of money and you can see why the conferences might want to realign. The problem is realignment requires stealing from other conferences which in turn damages schools that might not rank as high in national perception. I’m an alum of West Virginia University and a rabid fan of Mountaineer sports. Thankfully, I’m one of the lucky fans, WVU is known fairly well across the country due to its recent successes on the football field and basketball court. My hope is that in the current conference shuffle WVU will be able to stay in a large conference be that the SEC, the ACC, or maybe even another reloaded Big East. Being relevant in the national spotlight gives WVU a chance to move on to a bigger and better things. But what happens to some of the schools that aren’t lucky enough to be a big draw? Schools like Baylor are left to scramble. No slight to Baylor but outside of their Women’s basketball program what athletics are they known for right now? That hurts them when it comes to conference realignment. Conferences will not want to pick up schools that do not have success in the revenue producing programs such as men’s football and basketball. This leaves those schools out in the cold. Their only choices then are to try and move to a lesser conference or attempt to go independent. One of the other issues that conference realignment brings into play is that it will kill of some traditional rivalry games. There are many rivalry games that could go away. The rivalry closest to my heart is the Backyard Brawl, established in 1895. This is the game between the University of Pittsburgh and West Virginia University. Since 1991 this has been an in-conference game between the two schools. However, with Pitt’s pending move to the ACC the future of the Backyard Brawl is in doubt. WVU is unlikely to move to the ACC and it looks likely that WVU will either move to the SEC or stay in the Big East when it merges with the Big XII. Personally, I’m hoping for the SEC. The nature of college football today is that if you lose one game you probably don’t stand a chance of going to the National Championship game. Its become an unofficial rule that if you are in a major conference the best tactical option is to schedule a weaker opponent in your out of conference games. A win is more likely and in turn your chance to play for a National Title stays high. Pitt and WVU are rivals and its been proven anything can happen when the two teams meet on the football field. Without the conference tie-in between the schools that mandates they shall play each other there is nothing making this game occur. In fact common sense would be to not play the game and schedule a weaker school to ensure a win and higher rankings in the football polls. The same would be possible for other rivalry games such as Texas and Oklahoma in the Red River Shootout/Rivalry. Rivalry games are going to become less and less common due to the changes in conference affiliation and the current landscape of college football. Overall, college athletics has become big business and the focus has shifted from the student athlete and in some cases the event itself to how much money a game can bring to a school. Schools are prioritizing the best way to make money off of athletics and the student athlete being lost in the shuffle. Its a shame because the student athlete is what makes the schools and the conferences money. My biggest worry is that this increased emphasis on conference affiliation and its monetary benefits could irreparably damage college athletics. This is supposed to be a game not a cutthroat business and I hope that everyone can keep that in mind as all this conference realignment takes place. Surprisingly Morning Erection gets about 100 visitors per day. Not exactly the numbers I want yet far more than I expected so soon after starting a blog. One hundred is as I said, not a big number but I feel it is enough of the same visitors to start a series that I hope generates traffic for me and others. Once a month I am going to try to have a guest blogger post new content on my site. My idea of the ideal guest blogger is someone who has great posts on their site. My guest bloggers don’t necessarily have to have a lot of visitors to their site because the most important thing is content that would warrant lots of visitors. So far two people have stepped up and accepted my invitation to blog for me. The first Saturday of every month starting on January 2, 2010 will be the start of the series. Our first guest blogger is Chris Ferrell from Nerds of the Round Table. The focus of the blog so far has been science fiction television but not restricted to that. Their December 10, 2009 post touts the benefits of Google. Chris is a self professed aficionado of the acclaimed Battlestar Galactica series. His post on January 2, 2010 will be on the subject of Battlestar. In their own words, “The Nerds of the Round Table was designed with the intent of providing a place for a wide variety of topics to be discussed. As we grow, we will be adding more writers that will help change the flavor of the site. Right now we have a strong focus on movies, TV, and Comics”. Please visit Nerds of the Round Table to see for yourself. I’ve asked people who have, in my opinion, blogs worthy of visiting on a consistent basis. I’ve asked bloggers who have left comments on my site and I have asked bloggers who when I left comments on their sites, have driven traffic to my site. In order to be a guest blogger on Morning Erection you must be willing to give me exclusive access to the post that you write. Exclusive rights to that post will only last for 30 days so then you will have the right to post this same content on your site should you chose to. I would also ask that the post be at least 200 words and have at least one image associated with it. It is also the responsibility of the guest blogger to promote their upcoming guest appearance at least once on their own site. Again, this is a series I would like to promote once a month with a new blogger each time. Should the same blogger be willing to post more than once, I will not refuse such a generous gesture, however, I would like to give new bloggers the first opportunity. Thank you. If you would like to participate and be a guest blogger on Morning Erection, please email me and let me know. If you would like to read an excellent article on Guest Blogging to find out more about it and why people do it, feel free. You are currently browsing the archives for the Nerds of the Round Table category.